Filthy surroundings, unbearable stink, and irritating flies have made life miserable for residents of Aftab Abad, a suburb of Peshawar, the provincial capital of Khyber Pakhtunkhwa (KP) province in northern Pakistan. The area was used as a dumping site by the municipal waste company for the hundreds of tonnes of urban waste produced every day in the densely populated city. This made life “hellish” for the residents of Aftab Abad – with around 200 houses surrounded by the rubbish dump. 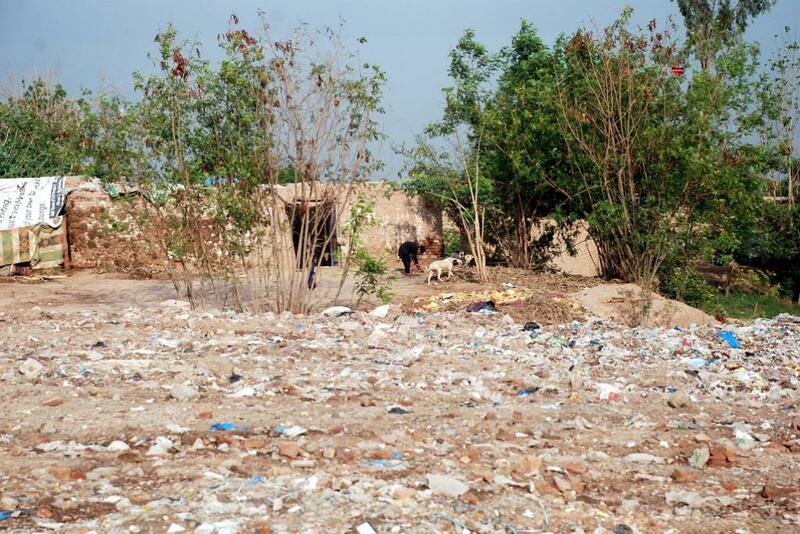 “The situation was so intolerable that despite our limited resources we were planning to migrate to some other place,” said local resident Abdul Hadi, whose house was about 30 metres away from the mound of rubbish, which also contained hospital waste. “Everyone had to wear face masks permanently to avoid inhaling the bad stench, while the presence of countless buzzing flies even after the sunset not only disrupted resting time but also spoiled our meals,” said Noor Nabi, another local resident. The population of Peshawar reached 4.2 million in the 2017 census, more than double the 1.97 million people registered in the 1998 census. This number does not include the hundreds of thousands of Afghan refugees who have been living in Peshawar for the last three decades, or people displaced by fighting in the Federally Administered Tribal Areas (FATA). At the same time, the city’s solid waste generation almost doubled in only four years – from 580 tonnes per day in 2014 to 1,016 tonnes in 2018. The Peshawar Cantonment Board – an independent municipality on military controlled land – produces an additional 60 tonnes of waste on a daily basis. Under this growing burden, the city has struggled to find a suitable site to dump its waste. The Water and Sanitation Service Peshawar (WSSP) – the government owned company responsible for waste collection in Peshawar – has come into increasing conflict with local residents across the city protesting against waste being dumped and left untreated on their doorsteps. After three months, Aftab Abad residents took the matter into their own hands and forcibly prevented the dumper trucks from unloading the waste. As a result, the company started dumping waste in another local area – shifting the problem elsewhere. On March 9, 2018, locals made announcements over loudspeakers in mosques, asking others to gather at the dumping site in Aftab Abad. The protestors also violently protested against the drivers of the Water and Sanitation Service Peshawar (WSSP) as they arrived to unload rubbish laden dumpers. “As I reached at the site for throwing trash, locals charged towards me and instructed me to go back,” recalls a driver of WSSP who did not want to disclose his identity. “Our staffers escaped to safety by leaving their vehicles empty,” said Muhammad Ayaz, supervisor at WSSP. “It is an injustice for people of my constituency that the city’s garbage is dumped at their door step, causing severe inconvenience to them,” said Fazl Elahi, a Member of the Provincial Assembly (MPA), who extended his full support to the protestors despite his association with the ruling Pakistan Tehrik-e-Insaf (Pakistan Movement for Justice) party. “I had personally witnessed dead animals lying in front of houses and locals were exposed to unbearable bad smells due to decomposing carcasses”, Elahi said. Public resistance badly disrupted the disposal of urban waste for sixteen days until March 21, with rubbish piling up on roads. As the crisis reached boiling point, the Chief Minister of Khyber Pakhtunkhwa, Pervez Khattak, was forced to intervene. As a result, the WSSP shifted the dumping of waste to a less populated area and selected 150 acres of land on the edge of the city for the development of a proper landfill site. 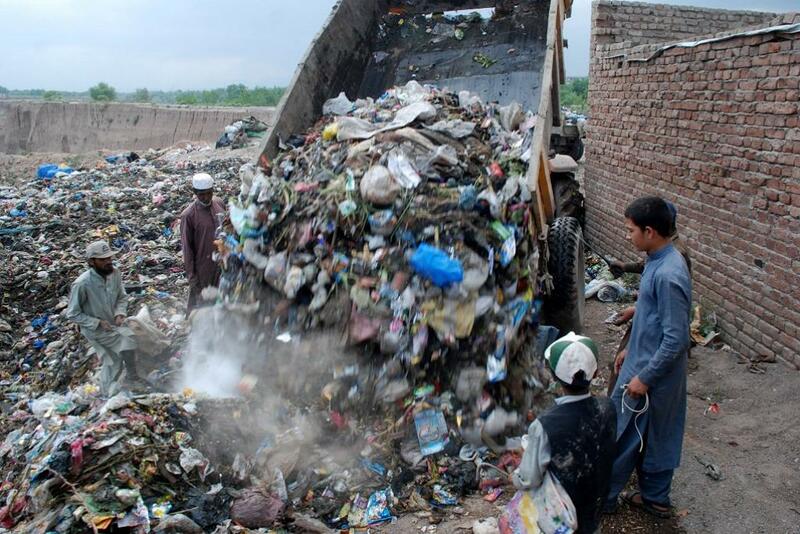 This is not the first time WSSP, which has been operating in Peshawar since 2014, has faced such resistance from locals over the improper disposal of solid waste. Earlier, the company faced similar resistance at the Hazar Khawani dumping site, after which the Aftab Abad site was selected and obtained on rental basis. In September 2017, residents of Hazar Khwani stopped WSSP staff from dumping waste in their area by holding a protest procession on the ring road. “The Hazar Khawani dumping site is a populated area and its residents were facing serious health hazards because of open dumping of garbage containing animal innards, surgical material, along with hazardous waste,” said Malik Misraf Khan, an advocate who lives near the Hazar Khwani landfill site. “The residents had to take dinner in darkness to avoid disturbance from mosquitoes and flies,” Misraf Khan said. “My own son has become asthmatic because of permanent inhalation of poisonous air,” he added. 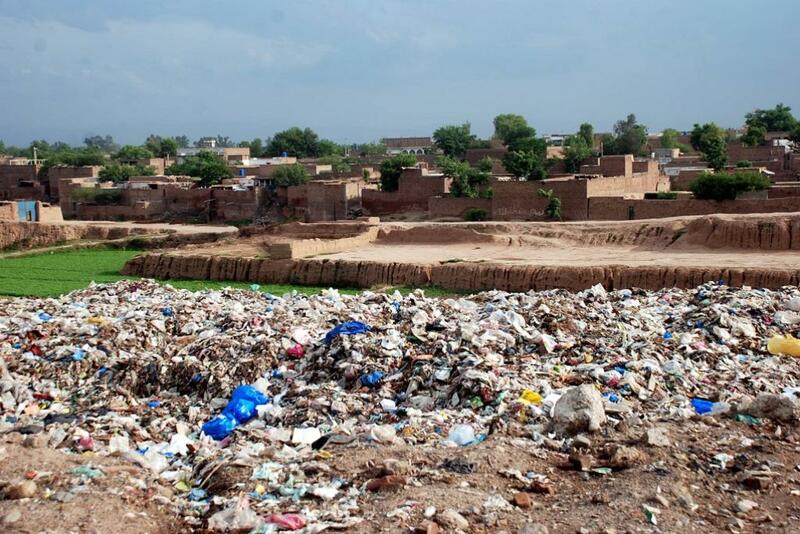 Misraf Khan has also filed a petition in the Peshawar High Court (PHC) on behalf of 62 residents of Hazar Khawani and Afridi Garhi against the dumping of solid waste near their homes. 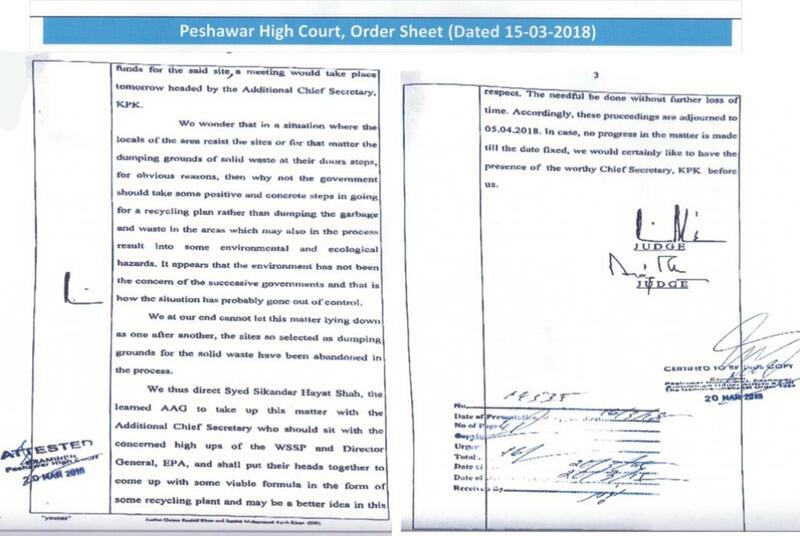 “We wonder that in a situation where locals of the area resist the sites for obvious reasons, then why doesn’t the government take some positive steps in going for a recycling plant rather than dumping of the garbage in areas which may result into some environmental and ecological hazards”, observed a bench of Peshawar High Court in its order released during the hearing of Misraf Khan petition on March 3. 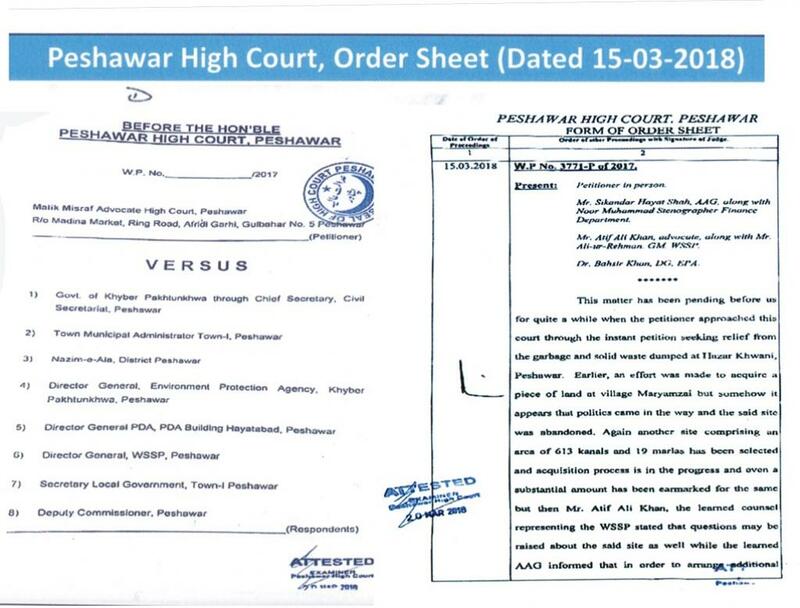 The High Court bench also observed that “earlier an effort was made to acquire a piece of land at village Maryumzai, but somehow it appear that politics came in the way and the said site was abandoned”. WSSP claims lack of money prevents them from developing a proper landfill site. “The main hurdle behind acquiring a proper landfill site and scientific disposal of solid waste is the financial constraints of KP government,” said Ali Khan, general manager of operations at WSSP. He estimates that the development of a site with appropriate treatment facilities including 150 acres of land will cost PKR 9 billion (USD 900 million). Donors including the Asian Development Bank and USAID had committed to funding the equipment for the proper disposal of solid waste, Ali Khan said, but these commitments are conditional on the proper acquisition of land. In 2014, WSSP floated an international tender for a waste-to-energy project in collaboration with KP Board of Investment, but the project did not materialise due to problems securing the land. Local resistance is proving an intractable problem. 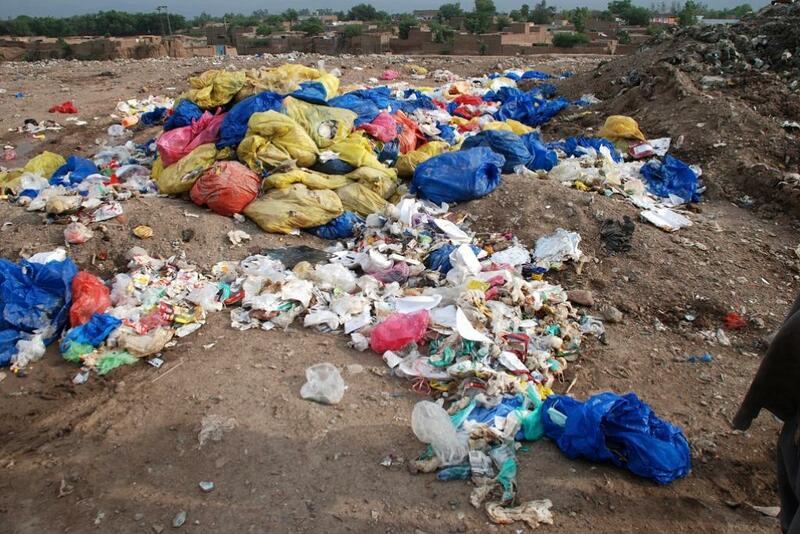 “Wherever WSSP selects the dumping site in Peshawar, elected representatives create hurdles to avoid accumulation of waste in their respective area,” said Fahim Sarhadi, a Peshawar based journalist working on environmental issues. When the WSSP opted for Maryam Zai site on Kohat road, the KP Information Minister, Shah Farman, objected the move. And MPA Arbab Jehandad objected to the Mian Gugar site on the grounds that it will damage agriculture land in the area, Fahim told thethirdpole.net. “This is a good sign reflecting the awareness of the public and politicians about health hazards due to unscientific handling of environmental issues,” Fahim remarked. But the real question is whether the protests will force the government take waste disposal more seriously or simply shift the problem elsewhere, where people are less vocal.